Sermon by Fr. 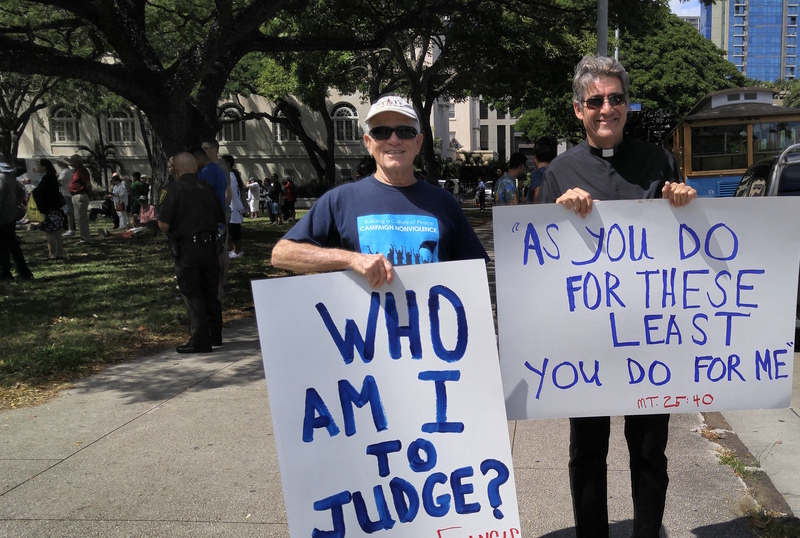 David Gierlach, St. Elizabeth’s Episcopal Church, Honolulu, seen here (right) protesting the views advanced by Rev. Franklin Graham during the latter’s visit to Honolulu earlier this year. Text reproduced here with permission. I welcome being pointed to anything similar delivered from the pulpit of a Catholic church. At a time when moral leadership is so desperately needed, the Catholic bishops are conspicuously silent, emerging only to weigh in yet again on the perils of marriage equality. The craven willingness of so- called Catholic leaders to align themselves with the poisonous politics of Donald Trump moves the bishops not a whit. Clearly they must see Paul Ryan, Chris Christie and Newt Gingrich, to name just three Catholic Trump endorsers, as faithful standard-bearers for the faith. We live in strange times. Reality host TV stars think they have what it takes to be president of the United States, and many millions agree. We see brands of Christianity that have precious little to do with the Gospels, with some advocating war as a Christian obligation, others saying that if God loves you, you’ll be rich, and still others claiming that true Christianity excludes nearly everyone. Yes indeed, we live in strange times. And into these times comes Jesus … not meek and mild but calling down fire, insisting that what follows in his wake is not unity, but division, not because of Jesus, but because of us. We know that Jesus is the prince of peace. That’s what the angels announce to those grubby shepherds so long ago on that hillside in Israel, it’s what Isaiah sees many years earlier as he dreams of the one who will not break the bruised reed, or quench the smoldering wick…. Yes, the promise of Jesus is the promise of peace, it’s just that we have such a hard time accepting that promise. When thugs pervert Islam and commit murder and mayhem, many voices demand a ban on all Muslims entering the country; some are even calling for the deportation of all people of the Muslim faith; yet Jesus says, when you welcome the stranger, the naked, the hungry, you welcome me; and when you reject them, you reject not only me, but the very one who sent me. My ways are not your ways, says the Lord, and the division that follows Jesus is the division caused when we insist on our own best thinking, when we rely on our love affair with what we so proudly call “common sense,” when we seek to protect ourselves and our stuff, in short, when we act as the fallen creatures that we are. The division Jesus announces comes to roost when the prodigal son comes home, there’s the elder brother, who always behaved, with steam coming out of his ears because he can only resent dad’s loving forgiveness of junior. It’s the division that sends the rich young man away, staring at his boots, the only person in all the gospels who explicitly says no to the explicit invitation of Jesus to follow; an invitation he rejects because he owns so much stuff that his stuff owns him…. 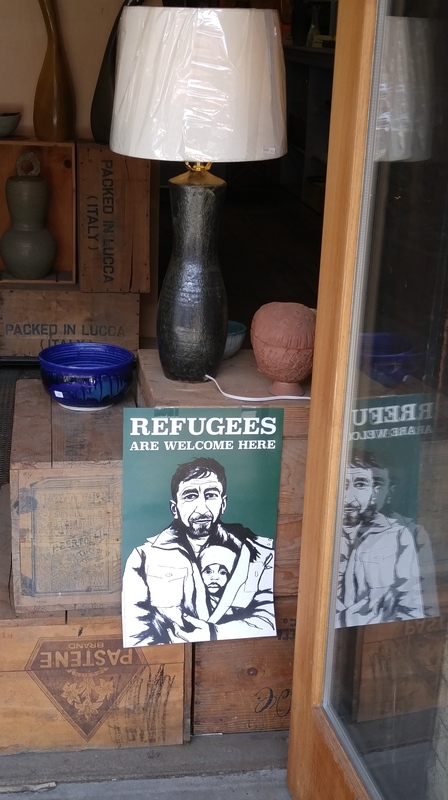 Compassion: Sign posted in the window of a small store in Pittsburgh’s Strip District. Today, it’s the division that shows up almost every Sunday in far too many of our churches, which continue to be the most segregated gathering places anywhere in our country…. It’s the division that occurs when we take the faith that calls us to change the world and turn it into something private and personal while turning a blind eye to the refugee, the immigrant, the poor…. A few weeks ago I went to a diocesan sponsored seminar on stewardship. I couldn’t stay for the whole thing, mostly because it was a seminar about raising money that with a very few tweaks, could have been presented to any group of Rotary Club members, Boys Clubs or YWCA’s…..in short, this seminar approached money not from a Christian place, but from a place that lines up very nicely with our culture and our American values. I had to leave because this seminar promoted quite shamelessly, the big lie: that we are the absolute and irrefutable owners of our wealth and therefore have the right to do whatever we please with what we have, and therefore have to be politely coaxed to part with it. But as our gospel lessons lately make abundantly clear, according to Jesus, we do not own our wealth or good fortune, and if we think we do, we are fools, and maybe worse. “The measure with which you measure will be measured back to you…” Lk. 6:38. You can see why serious divisions pop up everywhere! Today’s gospel is a call to all of us to come home again, back to the faith that Jesus teaches, a faith that isn’t so much about right and wrong or sitting on a cloud in heaven, but a faith that is all about dying and rising….something way more terrifying, yet way more exhilarating, than nit-picking behavior or strumming a harp. Today’s difficult and challenging and fearsome gospel is a reminder that the church is the Body of Christ in its visible form on earth, that we gather every Sunday not because we are a social club or to meet some vague obligation to God, but precisely because we are Christ’s Body, and when we gather here, heaven and earth hold hands, the sacred and the profane embrace, so that when we leave this place we can witness in our lives to the magnificent mystery of giving up in order to receive, of letting go in order to find, of dying, so that like him, we may rise again…. Perhaps now more than ever, the world is dying for the faith that gives life, and so let us join with our Lord as we too embrace our baptism, a baptism that calls us to die to our best thinking, and to rise in the foolishness of the cross. Never forget, “Christ has no body now but yours. Christ has no body now on earth … but yours…” St Theresa of Avila. This gave me so much hope. Too much publicity goes to those who advocate violence and exclusion. Thank you for making some noise! And when the bishops do speak out, this is how they do it.